Welcome to another installment of If My Book, the Monkeybicycle feature in which authors shed light on their recently released books by comparing them to weird things. This week Paul Crenshaw writes about his debut essay collection, This One Will Hurt You, out now from Mad Creek Books/Ohio State University Press. If This One Will Hurt You were an animal, it would be a kitten trying to cross a backyard or a possum beneath the porch. This would be a Sunday afternoon in October, when all the good and bad things come together, and it would be in a town full of people who’ve had their hearts broken so many times they’re more scar than tissue. They drink a little too often and love a little too much, and they try not to talk about the bad things occurring this October afternoon but can’t help themselves—they’re not built that way. In this town are two churches, right across the street from each other there in the center, and on this Sunday—while the kitten that is my book is carefully crossing the backyard—the bells have just rung and church has just let out and people are going down the stairs there in the center of town in their dresses and suits thinking of Sunday dinner, because everyone eats Sunday dinner after changing out of their church clothes. It’s still warm enough that children gather to throw the football in backyards where kittens are stealthily crossing, and it’s late enough in the season that they look at the sky and understand this day will end too soon. Meanwhile, men are chopping wood for the winter they know is coming. Women are putting away the Sunday dinner, covering the casseroles. When night falls, mothers will read Goodnight Moon and Where the Wild Things Are to their children. They understand there is in the words of the books they read something sinister lurking, but they read anyway because there is something sinister lurking in the town too, though it is not the monsters of movies, but the wild things inside all of us. It sits in the shadows lengthening out into the October afternoon. Maybe we should call it sadness. Maybe it’s the understanding that this is all ending, everything we see, everything we know and love and taste and touch, that we are all, in the end, a little kitten crossing a backyard, trying to find our way home. We are an October afternoon that will end. We are wild things constantly looking for a place to let out all the angers we feel. We are church bells tolling into the blue sky, and we should be sad—we are sad—but we also know that scarred hearts are forever healing. We know Christmas eve is darkest before the lights come on. That finding our way home is more than simply crossing a backyard. We know we might never make it to a place where all the sadness and anger inside us is stilled, and we know it will hurt to make it there, wherever it is, whether some make-believe land or only the silence of standing in the snow, looking at the lights of the houses all around us. But we keep trying. We keep crossing. We keep circling, night after night, trying to find the way home in the form of supper waiting for us, smoke from a woodstove, the silence of a house after everyone has gone to sleep. Paul Crenshaw’s writing has appeared in Best American Essays, Brevity, North American Review, Ascent, Gulf Stream, The Rumpus, Hotel Amerika, and River Teeth, among many other venues. He was a finalist for the Bakeless Prize and the recipient of a Pushcart Prize in 2017. 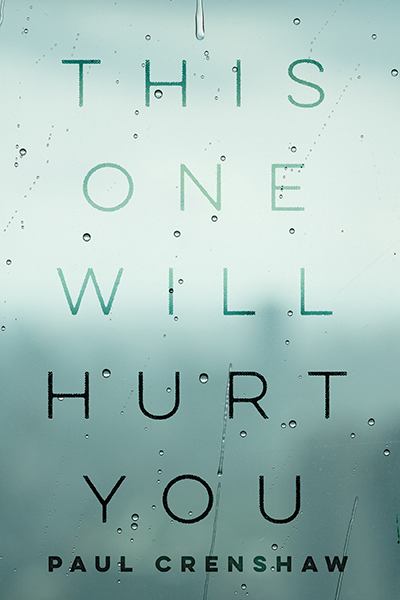 This One Will Hurt You is his first essay collection, and his second is forthcoming from University of North Carolina Press. Find him on Twitter at @paulcrenstorm.